The 1988 United States presidential election in Texas took place on November 8, 1988. All fifty states and the District of Columbia, were part of the 1988 United States presidential election. Texas voters chose twenty-nine electors to the Electoral College, which selected the president and vice president. 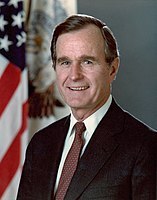 Incumbent Vice President George H. W. Bush won his home state against Massachusetts Governor Michael Dukakis. Bush ran with Indiana Senator Dan Quayle as Vice President, and Dukakis ran with Texas Senator Lloyd Bentsen. Texas weighed in for this election as 2% more Republican than the national average. The presidential election of 1988 was a very partisan election for Texas, with more than 99 percent of the electorate voting for either the Democratic or Republican parties. This is one of the last elections in Texas where you see many rural counties (including a large Democratic stronghold along the border with Louisiana) voting for the Democratic Party, and the populated counties, such as Houston's Harris County, voting mainly for the Republican candidate. Since the presidential election of 1996, this demographic trend in Texas has reversed to its current form of "urban Democrats" and "rural Republicans" as it has elsewhere in the United States. An exception to this lies in a group of almost entirely Mexican-American counties in South Texas, which were and remained overwhelmingly Democratic. Of these, Starr, Zavala, Duval and Brooks Counties gave Dukakis over eighty-one percent of the vote and were his four strongest counties outside the District of Columbia, with Starr being his strongest nationwide. As of the 2016 presidential election[update], and despite Bill Clinton's two ensuing nationwide election victories, the 1988 election constitutes the last occasion when Lee County, Calhoun County and San Saba County have supported the Democratic presidential nominee. Bush won his home-state with a solid 12 point landslide. This election marks one of the first times that Texas has proven (post Reagan) to be a reliable Republican vote, and a decisively large player in Southern politics. The election results in Texas are also reflective of a nationwide reconsolidation of base for the Republican Party, which took place through the 1980s. Through the passage of some very controversial economic programs, spearheaded by then President Ronald Reagan (called, collectively, "Reaganomics"), the mid-to-late 1980s saw a period of economic growth and stability. The hallmark for Reaganomics was, in part, the wide-scale deregulation of corporate interests, and tax cuts for the wealthy. Dukakis ran his campaign on a socially liberal platform, and advocated for higher economic regulation and environmental protection. Bush, alternatively, ran on a campaign of continuing the social and economic policies of former President Reagan - which gained him much support with social conservatives and people living in rural areas. ^ "Dave Leip's Atlas of U.S. Presidential Elections". Uselectionatlas.org. Retrieved 2013-07-21.